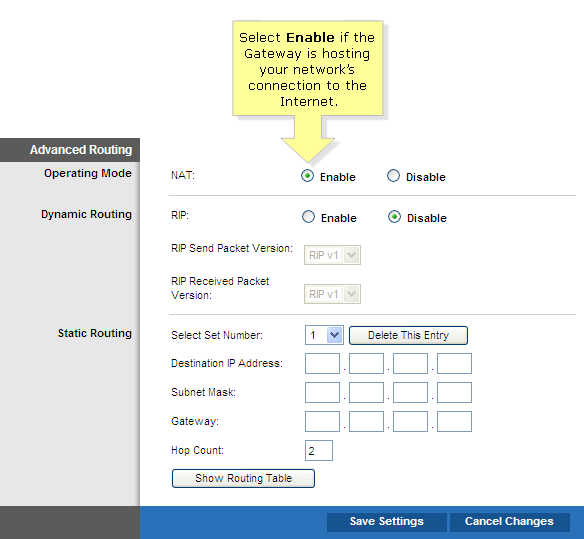 The Advanced Routing screen is used to set up the router/gateway's advanced routing functions. This feature is only applicable to advanced network topologies. Normal Internet usage does not require this feature to be changed. Access the router's web-based setup page. For instructions, click here. For ADSL Gateway, click here. NOTE: If you are using Mac to access the router's web-based setup page, click here. For Mac to access the gateway's web-based setup page, click here. Look for NAT next to Operating Mode. If the Gateway is hosting your network's connection to the Internet, keep the default, Enable. Else, select Disable. NOTE: NAT table may get full because Peer to Peer applications will create many connections and flood NAT tables. Torrent or online gaming will the main cause for flooding NAT tables or saturating upload bandwidth and strangling downloads, which severely reduces network performance. 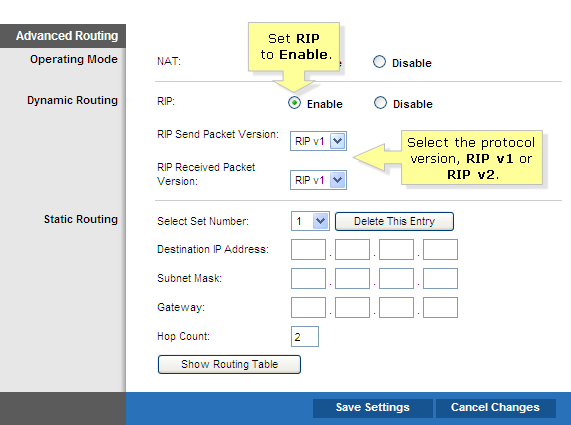 In the Dynamic Routing section, set RIP to Enable. Otherwise, keep the default, Disable. Next, select the appropriate protocol version, RIP v1 or RIP v2. This should match the version supported by other routers on your LAN. 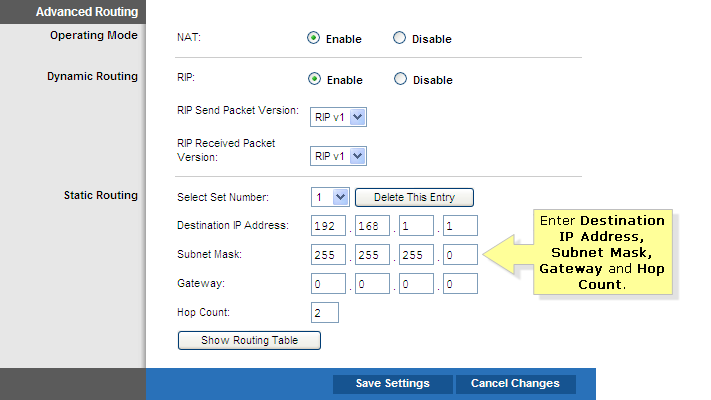 NOTE: Routing Information Protocol (RIP) allows the Gateway to automatically adjust to physical changes in the network's layout and exchange routing tables with other router(s). 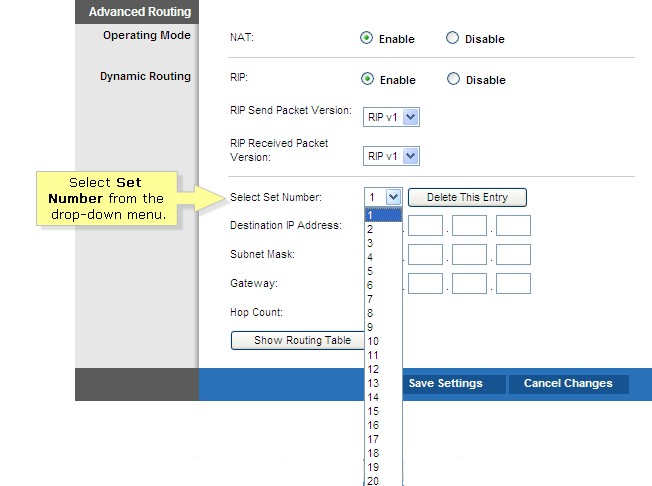 Look for Static Routing and click Select Set Number to set static route. You can set up to 20 entries of static routes. Next, enter the Destination IP Address, Subnet Mask, Gateway and Hop Count. 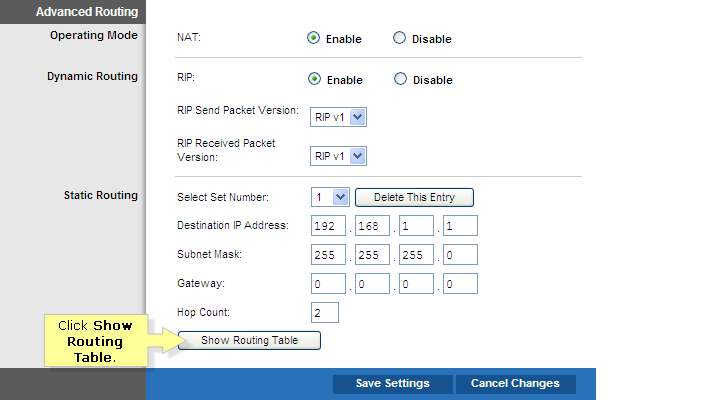 Next, click Show Routing Table to view the static route(s) you already set up. Click Refresh to update the information. Click Close to exit the screen.